Please take a look at the AllVolumeAverage_v2 indicator which helps to detect Volume Breakouts at the market and can also be used to confirm the signal. This is upgrade of well-known VolumeAverage which I ported from EasyLanguage version. Plus you can find Buy/Sell signals with advanced Box alerts. 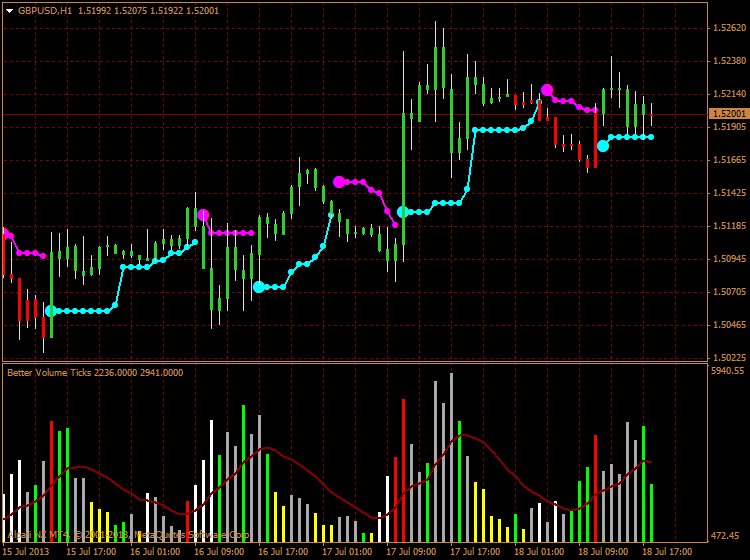 TCT and chartartist like this. How to use this indicator? And what is the best settings of it? 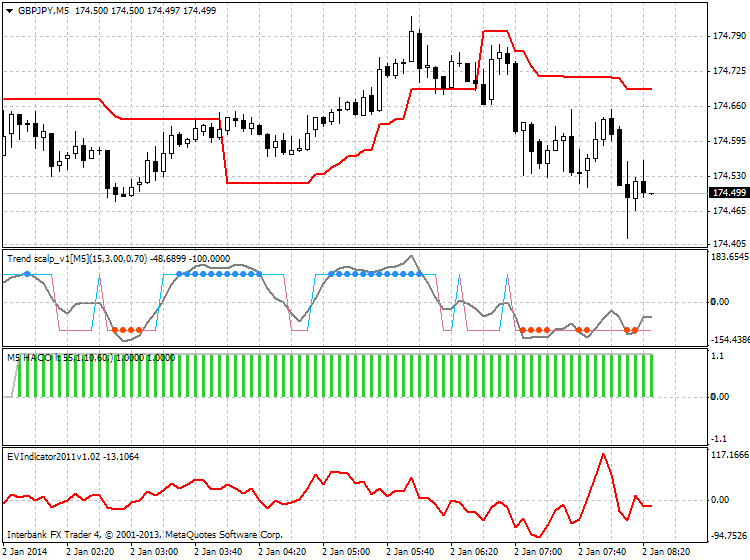 I found good explanation how to use this indicator in TradeStation but seems it can be useful for MT4. I just found some article about how to use this or similar indicators. Volume in charts is usually expressed as the number of Shares traded that day. It is most useful to view volume indicators in comparison to what is the normal number of Shares traded for a stock on average. For example if volume starts to increase dramatically for a stock we can assume there has been some news, earnings release or otherwise external factors acting on the stock. What happened to Volume when the price changed? What happened to the price when volume spiked? Did you notice the chart was on an Algorithmic Scale, not a Logarithmic? We can see this from the price moving in fixed increments $20, $22, $24. Always try to use logarithmic, it helps you view potential % gains and losses so much easier. Most professional technical analysts use Logarithmic scaling, it produces the best results. 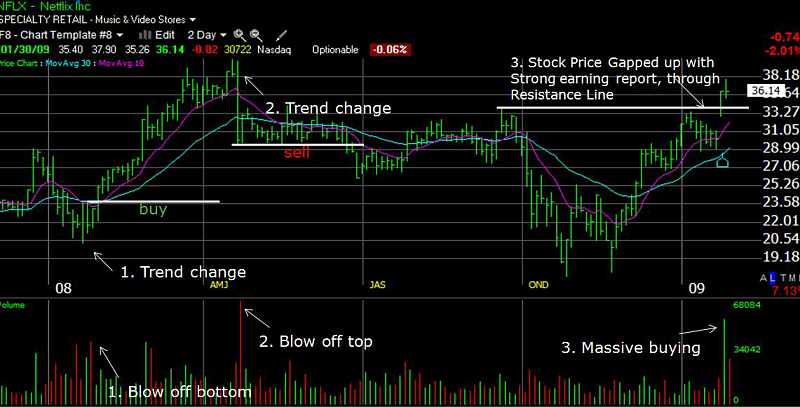 Now look at the chart below and read further for a description of the key concepts here. The Chart maps Price, Moving Averages 10 & 30, and volume (Red for Negative, Green for Positive). Key Points, referenced in the Chart. 1. here at point 1 we see a huge change in the direction of price, it was proceeding in a downward direction, then suddenly there was a spike in volume over 2 weeks, this is known as a “blow off bottom”. It indicates, that a key price has been founds, where the sellers have lost enough that they need to sell the stock, and the buyers have seen the price decrease enough so that they see real value in the Stock. Of course other factors contribute, like good News, or earnings results. Whatever happened volume increased! 2. the stock here increases from $20 to $38 in the following 3 months, a 90% increase, but how would we know this was about to happen. Well, buying at the time the moving averages crossed over would have been a good option, it would not have provided the full 90%, but it would have produced 40%, which by anyone’s reckoning is an excellent result. However here we see a monster “Blow off Top”, the huge red Spike, this is a very strong sign, to sell as soon as possible. From stage 2 we see the stock move in a sideways patter and eventually decrease back down to $19, the ride is well and truly over. However you would not own the stock, as you would have sold when the Moving Averages crossed. The stock price starts to increase in mid November 2008, but volume tells us nothing, WHY? Indicators do not tell us something 100% of the time, but when they do we need to recognize it. 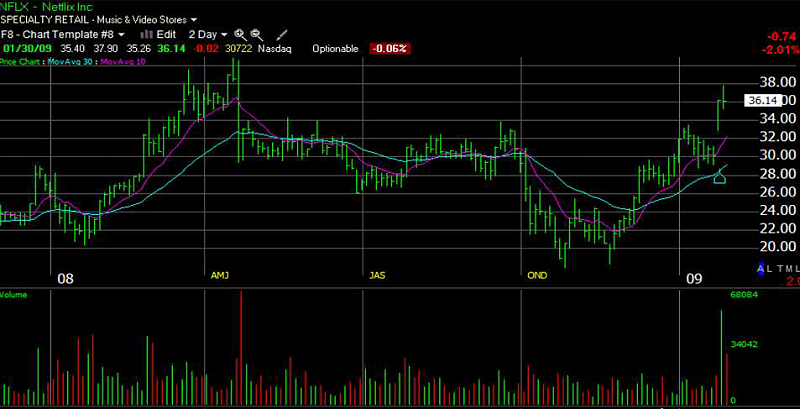 The moving averages cross at $25, a good time to buy. 3. Here we see massive buying; the volume goes through the roof. Important to note here is we are comparing Volume for the stock in comparison to its history. This is the second biggest volume surge of the year for Netflix, and is significant. Why did it take off? We should always seek enlightenment! It reported excellent earnings, and because of the recession people were switching from buying bigger ticket items such as Cars and Plasma TV’s to staying at home and renting Movies. Netflix reported a massive increase in new members. 4. In the chart the note shows that the price “Gapped Up”. What does this mean? This means that the stock price in extended hours trading was so strong that the Opening Price on the following day was significantly higher than even the High for the previous day, thus showing a Gap in the price pattern in the chart. And I found some old thread on FF forum (our friendly forum) about trading system which can be used with this indicator : Average Volume Indicator? And for now - please take a look at this volume indicator (attached). that nice indi compile with b600+ , but get some "arrays passed by reference only" warnings; Nothing very scary, but i cant find how to fix them. I wonder if you can reload it with the fixes (showing me the way the fix such warnings with other indis). 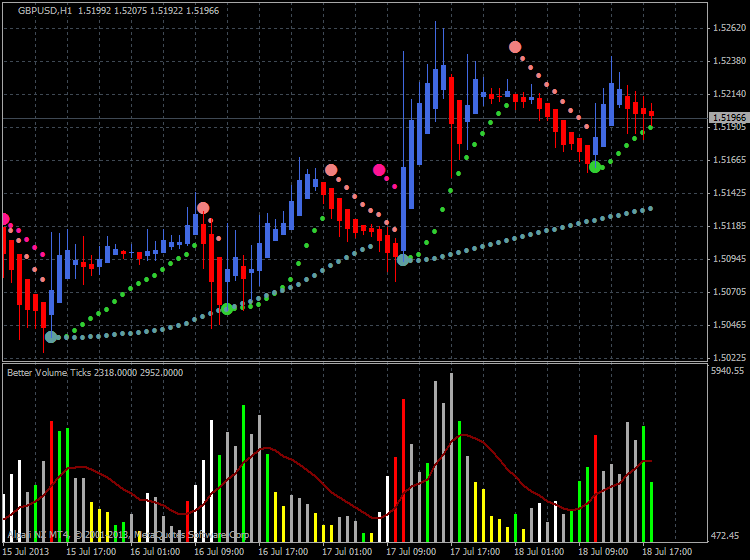 Please check out the updated AllVolumeAverage indicator for the new MT4. lion of gail, goldseeder, chartartist and 1 others like this.